When you are handicapped, have balance problems or have any other issue that prevents you from easily entering and exiting a pool, life can become frustrating. Fortunately, the EZ Pool Lift by Aqua Creek couples convenience with affordability so you can once again easily access and enjoy your home pool or spa. Ideal for any residential application, this handicap pool lift can easily be operated manually by one attendant. It accommodates in-ground pools in addition to partially in-ground pools and spas with wall heights up to 26 inches. It offers lifting capabilities up to 400 pounds and can also make a great boat access lift! 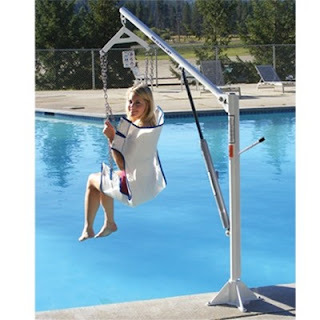 The EZ Pool Lift is crafted with stainless steel and a durable UV-resistant, white powder-coating finish, so you can rest assured that this lift will remain safe and work corrosion-free for years to come. The compact EZ Lift can act as either a fixed or a portable lift, and it can easily be stored and moved so you can relocate from your pool deck to your boat deck and back again whenever you need! When you’re searching for the best swimming pool hoist for your home, search no further than the Aqua Creek EZ Pool Lift. With additional options like a hard seat and a protective cover, there’s no beating this durable, affordable and easy-to-use residential pool lift. Get back to doing what you love and order yours from PHC-Online today to save and receive fast and free shipping!